Chopin’s “Minute” Waltz, arranged for Oboe and Piano. Oboe part and Piano score included. As heard on Music That SHOULD Have Been Written for the Oboe. I performed this arrangement for the first time in 2003, but never actually made the physical transcription until now. It exists as a PDF download – ready to be printed, double-sided if you wish, with performable page-turns – or as a hard copy, sturdily bound to last through years of practice and performance. The oboe part and piano score are included. 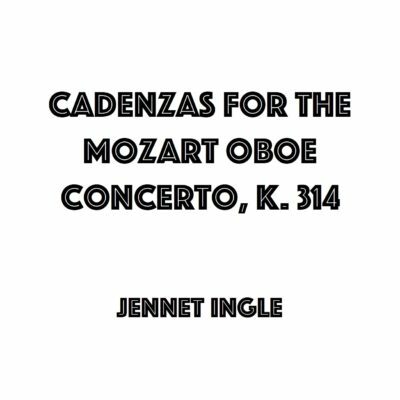 This is the arrangement that you can hear on my CD, Music That SHOULD Have Been Written for the Oboe. I will always mail your order within seven days of receiving payment. I ship via USPS First Class mail, which usually takes 3-5 days within the US. Questions about tubes or my gouge/shapes? See here. © 2019	Jennet Ingle . All Rights Reserved.